Looking for a new car, truck, or SUV near Petoskey? 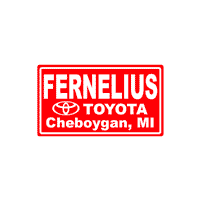 Look no further than the new Toyota inventory supporting Cheboygan car dealers like Fernelius Toyota! We offer many models that’ll keep you going around Indian River. From the popular RAV-4 SUV to the impressive Toyota Highlander, there’s something for anyone looking to upgrade their commute. When you’ve found the Toyota that you want to learn more on, come down to Cheboygan to check it out for yourself in person! Browse through our new vehicle incentives before you come for extra savings. Why Choose a Toyota from Fernelius Toyota in Cheboygan? Our team is prepared to help guide you on your next vehicle purchase. Once you’ve decided you want to find your next vehicle at Cheboygan car dealers like ours, come down to see us, or contact us with any questions you may have.